Phagocytes are the white blood cells that protect the body by ingesting harmful foreign particles and help initiate an immune response. Many white blood cells and other cells in the body use phagocytosis to engulf and kill cells. Phagocytosis occurs over several steps, which include binding to an opsonized pathogen with a receptor and killing it using an oxidative burst. Monocytes are phagocytes that can differentiate into macrophages and dendritic cells based on conditions within the body. Macrophages are the cleanup crew for the innate immune system. They remove debris, pathogens, and dead neutrophils after an inflammatory response. polymorphonuclear (PMN) granulocytes that are the first responders to an inflammatory response. They kill pathogens through phagocytosis and degranulation, but die as a result. Mast cells are circulation PMN granulocytes that trigger an immune response by releasing an inflammatory mediator when they detect an antigen with their toll-like receptors. oxidative burst: A chemical reaction that occurs in phagocytes in which an engulfed pathogen is destroyed by exposure to oxidative stress from reactive oxygen species. PMN granulocyte: A type of phagocyte that contains PMN granules, most notably neutrophils and mast cells, but also basophiles and eosinophils. Any cell that undergoes phagocytosis, a process in which pathogens and other foreign particles and debris are engulfed by a cell to be destroyed, is considered a phagocyte. Most phagocytes are types of white blood cells that use phagocytosis to perform basic innate immune system function within the body. A receptor on the phagocyte’s cell membrane binds to a foreign particle, such as a pathogenic microbe or a toxin. The Fc receptor is typically the receptor of use, which binds to antibodies that have opsonized (marked) a pathogen or toxin. The cytoplasm surrounds and engulfs the bound pathogen through endocytosis. The engulfed pathogen is kept in a vacuole called a phagosome, which then binds to the lysosomes inside the cell. A series of chemical reactions called an oxidative burst occurs, which uses reactive oxygen species and NADPH oxidase to damage and kill the pathogen through oxidative stress. Oxidative stress can kill a cell through DNA, cell membrane, or mitochondrial damage. The remains of the pathogen are expelled by exocytosis. These are the general mechanisms used by phagocytosis to engulf and kill pathogens, but some variations can occur. For instance, other receptors may be used to engulf pathogens, and other non-oxidative methods (such as lysozyme) exist to kill the phagocytized pathogen. There are many classes of phagocytes within the body, each with different specialized functions involving phagocytosis. Most phagocytes are derived from stem cells in the bone marrow. The main types of phagocytes are monocytes, macrophages, neutrophils, tissue dendritic cells, and mast cells. Other cells, such as epithelial cells and fibroblasts, may also engage in phagocytosis, but lack receptors to detect opsonized pathogens and are not primarily immune system cells. Monocytes develop in the bone marrow and reach maturity in the blood. Mature monocytes have large, smooth, lobed nuclei and an abundant cytoplasm that contains granules, but are not technically considered granulocytes. Monocytes ingest foreign or dangerous substances and present antigens to other cells of the immune system. Monocytes form two groups: a circulating group and a marginal group that remains in other tissues (approximately 70% are in the marginal group). Most monocytes leave the blood stream after 20–40 hours to travel to tissues and organs; during this process, they differentiate into macrophages or dendritic cells depending on the signals they receive. Mature macrophages are derived from monocytes, granulocyte stem cells, or the cell division of pre-existing macrophages. Macrophages do not have granules, but contain many lysosomes. They are found throughout the body in almost all tissues and organs, but are rarely found in the bloodstream. Macrophages cause inflammation through the production of interleukin-1, interleukin-6, and TNF-alpha. Macrophages are activated in a number of ways, including by T cells, cytokines such as IFN-gamma, or pathogen-derived compounds such as LPS toxins from bacteria. During inflammation, they enter about 72 hours after the initial response to clean up debris and dead neutrophils. 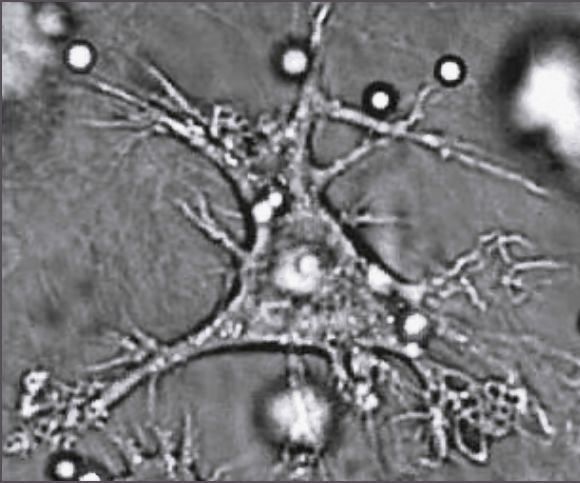 Dendritic cell: Dendritic cell characterized by membranous projections that resemble spines. Dendritic cells are specialized antigen-presenting cells that have long outgrowths called dendrites, which help to engulf microbes and other invaders. They express MHC class II molecules, which makes them the ideal antigen-presenting cell. Dendritic cells are present in the tissues that are in contact with the external environment, mainly the skin, the inner lining of the nose, the lungs, the stomach, and the intestines. Once activated, they mature and migrate to the lymphoid tissues, where they present antigens to T and B cells to initiate the adaptive immune response. This involves deriving T and B cells that are specific towards a single antigen from naive lymphocytes. Neutrophils are a type of PMN granulocyte normally found in the bloodstream. They are the most abundant type of phagocyte and the first responder during inflammation. Once they have received the appropriate chemokine signals, neutrophils leave the bloodstream and reach the site of an infection through adhering to the vascular endothelium to squeeze into the tissues. There, they rapidly engulf invaders coated with antibodies, damaged cells, or cellular debris. They also degranulate to release perforin, granzyme, proteases, and other chemicals to cause cytotoxic damage to pathogens (and occasionally normal bodily tissues as well). Neutrophils die after phagocytosis, becoming pus that is later cleaned up by macrophages. Extravasion of Neutrophils: Neutrophils move through the blood to the site of infection by rolling onto the vascular endothelium and adhering to it to slip through small gaps into the tissues during an inflammatory response. Mast cells are PMN granulocytes with toll-like receptors that tend to trigger inflammatory responses. Mast cells express MHC class II molecules and can participate in antigen presentation; however, the mast cell’s role in antigen presentation is not well-understood. Mast cells can consume, kill, and process their antigens. In addition to these functions, mast cells produce cytokines kept in their granules, such as histamine, that induce an inflammatory response when a pathogen is detected. Because of this function, allergic inflammatory responses occur when a mast cell is sensitized to an antigen that it normally wouldn’t react to. 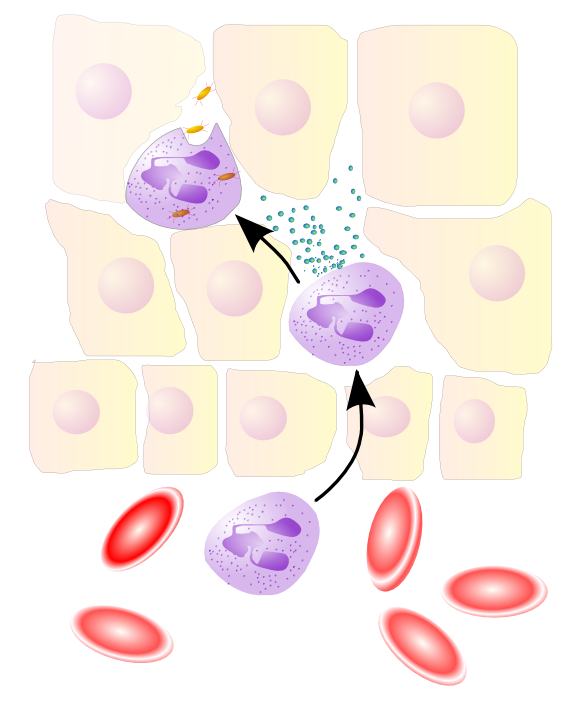 Leukocyte Differentiation: Phagocytes derive from stem cells in the bone marrow. 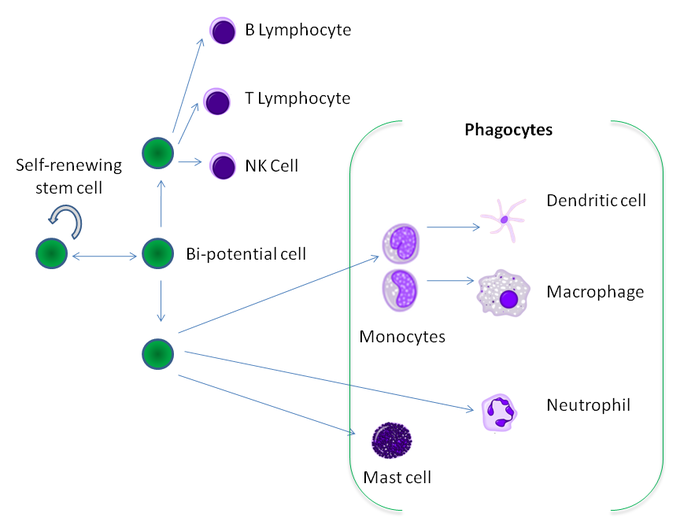 Monocytes differentiate into dendritic cells and macrophages, while mast cells and neutrophils are in a separate group of PMN granuolcytes as well.